As I take a quick glance at all the reviews I've done so far in 2011, I notice two things. Firstly my post count is very low on last year. Secondly, and with less vanity, there's been a genuine shortage of really classy action movies over the past year. Thankfully the arrival of Nicolas Winding Refn's - last seen in the director's chair with the Tom Hardy breakout hit, Bronson in 2009 - Drive which blew audiences away at this year's Cannes Film Festival and left Refn picking up the award for Best Director has made the wait worth it. 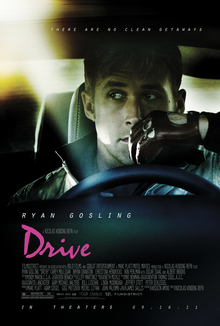 Based on the book by James Sallis, Drive tells the tale of an enigmatic stunt driver (Ryan Gosling) who moonlights as a getaway driver for criminals. When one last heist goes wrong, and he finds himself in trouble with the local mob, what unravels before the audience's eyes is one of the most visceral action experiences you'll find in the cinema all year. Ryan Gosling is superb in the leading role, almost playing two distinctly different men in the way he conducted himself. The first side was this introverted, pleasant man of few words. Occasionally throw the odd warm glance or light hearted smile. Then the other side where he's this relentless, violent, absolutely mental human being who stamps men's heads in until they're near liquefied. Equally so the supporting performances were littered with genuine class from beginning to end. Carey Mulligan as the love interest, who shared some lovely shoegrazey 80s influenced moments with Gosling. Bryan Cranston, now living it up as one of Hollywood's best since wowing audiences with the TV smash, Breaking Bad, was astute as the confidant/partner to Gosling's operations. Ron Pearlman as some deranged L.A. gangster. The true stand out performance however was the excellent Albert Brooks as Pearlman's partner who surely deserves a decent shot at the Best Supporting Actor category in next year's Oscars. Nicolas Winding Refn direction was certainly worthy of his Cannes hype, making a film which puts even some of Tarantino's best to shame with the manner it's told and the violence factor - none more so than in Christina Hendricks' less than subtle demise. The comparisons to classic movies such as Bullitt shine through, but despite the glamorous cast, I enjoyed the stripped down indie feel, which of course carries over from Refn's background and a 'feel' I hope he can bring to the bigger projects likely to follow off this success. Special praise must be made for the wonderful 80s esque soundtrack which also combined brilliantly with the tense, atmospheric, soundtrack by Cliff Martinez, which had faint echoes to Hans Zimmer's work with Christopher Nolan in parts. If I had one tiny complaint to the whole feature however it would be the sparse distribution and volume of the frantic car chases I had imagined, but the whole story, and sheer mental action sequences made up for it. Ryan Gosling shines in a relentless leading role which was supported by true acting heavyweights such as Bryan Cranston, Albert Brooks and Ron Pearlman. Nicolas Winding Refn has created a retro action film full of intensity, ultra violence and, heaven forbid, a brilliant plot. Easily one of the best films this year. Drive is in cinemas everywhere now.